Here are some events organised or supported by Otis Beanery or where we will be appearing. Would you like Otis Beanery to be part of your food event or festival? Please contact us and we'll get back to you shortly. rice paper rolls - let's learn! Otis Beanery is going to be providing a free cooking demonstration and tasting -nom! - at Taste of the World, Sunday 26th May. The demonstration times are 11.30am and 1pm in the Cultural & Family Activities Marquee 1. The festival itself runs 11am-4pm. Come on over and we'll show you how to make a healthy spring roll. The demonstration is quite short and we'll be showing two different styles: a classic Asian style roll and a more modern fusion one with some funky ingredients. It's all happening at Benjafield Park, Moonah. Be there! After the positive feedback from the private restaurant events last year, I've decided to hold quite a few more this year. In particular I want to make the dishes that will be in my forthcoming book. In this sense the food is local and practical (and still delicious) rather than uber-gourmet as the recipes have been developed to maximise use of seasonal ingredients. These 4-course vegan dinners seek to make the most of Tasmanian produce in modern-style dishes inspired by cuisines from around the world. All vegan, all very tasty, why not treat yourself to a great night out? Bookings are absolutely dead-set fair dinkum essential so please get in early before the limited places are sold out. Click on the button below to go to the booking page. This is a private dinner so you are welcome to BYO. Look forward to having you for dinner! Otis Beanery will be back at The Taste this year, Tasmania's premier food festival. The festival runs from 28 December 2015 to 3 January 2016. Venue is as usual the precinct around PW1 and Parliament Lawns by the waterfront in Hobart. The Kids Kitchen sessions are all on the lawns proper. 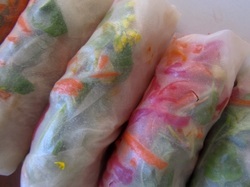 spring rolls...make one with us! Otis Beanery is going to be involved in a free cooking demonstration at Dads' Day Out at Montrose Bay on Saturday 7 November, 11am-2pm. We'll have a stand set up where you can come on over and we'll show you how to make a healthy spring roll. The demonstration is very short and then we'll help you make one for yourself...there'll be lots of tasty fillings to choose from! There will also be some sports to try, information stalls and other family friendly activities. Have a look at the Dad's Day Out flyer which will give you some idea of what to expect. Why not come along for some fantastic fun? Free entry. Hope to see you there! After the positive feedback from the private restaurant event earlier in the year, we're holding another one. All the details are on the listing at Bookalokal including full menu. This is a one-night only event on Friday 27th November from 6.30pm until finished. This extravagant 4-course vegan dinner seeks to make the most of local ingredients in modern-style dishes inspired by cuisines from around the world. All vegan, all sumptuous, why not treat yourself to a great night out? Bookings are absolutely dead-set fair dinkum essential so please get in early before the limited places are sold out. 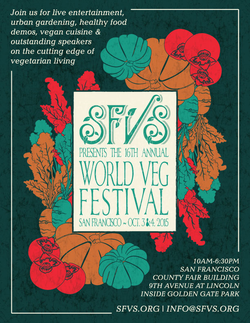 Alan of Otis Beanery is a guest speaker on the program at the 16th annual World Veg Festival in San Francisco, this 3-4 October 2015. Please see their site for full details of all events, entertainment and speakers on the program. It's certainly a major vegan event that is worthwhile taking time out to attend if you are in the area. Alan will be speaking about a vegan investment fund he is working on: what it will be; how it will work; what it might invest in; what the challenges are to getting it started." The talk is from 11.45-12.45 on Sunday 4 October in the Garden Club room. It would be great to see you there. Alan will also be at the Festival before and after this talk if you would like to meet him. If you are unable to attend and are interested in the vegan investment fund project, please contact us and we will add you to the fund mailing list. We expect to send out an email in late 2015 advising on progress toward the establishment of the fund. 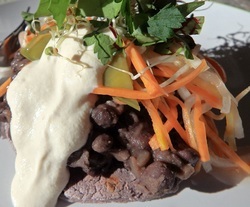 Otis Beanery will be serving up some delicious Colombian arepas at Moonah Primary School's Multicultural Feast. You are very welcome to get along to MPS in Derwent Park Rd between 12 ﻿noon and 2pm on Saturday 5 September to join in the fun. You can sample of t﻿he arepas I've made - with a serve of mildly spiced black beans and some vegan sour cream - or I'll give you an up-close demonstration of you how to make one yourself. And of course there'll be plenty of other food there and some fantastic entertainment from our very diverse community. 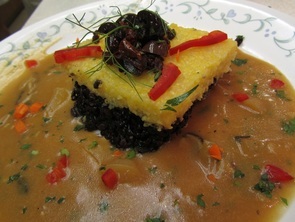 We're holding a Colombian Banquet private restaurant event! All the details are on the listing at Bookalokal. The two sessions available are on Friday 21 August and Saturday 22 August, both from 6.30pm until finished. This extravagant 4-course dinner includes some delicacies such as patacones that you just can't find anywhere in Hobart. All vegan, all sumptuous, why not treat yourself to a great night out? Bookings are absolutely dead-set fair dinkum essential so please get in early before the limited places are sold out. Set your sights now on a trip of a lifetime that you will fondly remember for the rest of your days! Amy Widdis from LVY Yoga and Zoe Davis Therapy have come together to create a spectacular retreat getaway like no other! 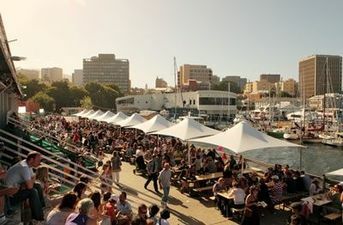 5 days and 5 nights of fun, yoga, meditation, energy clearing, awesome healthy fresh food, nature walks, sightseeing including a full day at the amazing MONA Gallery, a stroll around the famous Salamanca Markets and visits to some of the best artisan galleries, shops, cafes and eateries that Hobart has to offer. Please see the website listing for more information and to reserve your place. 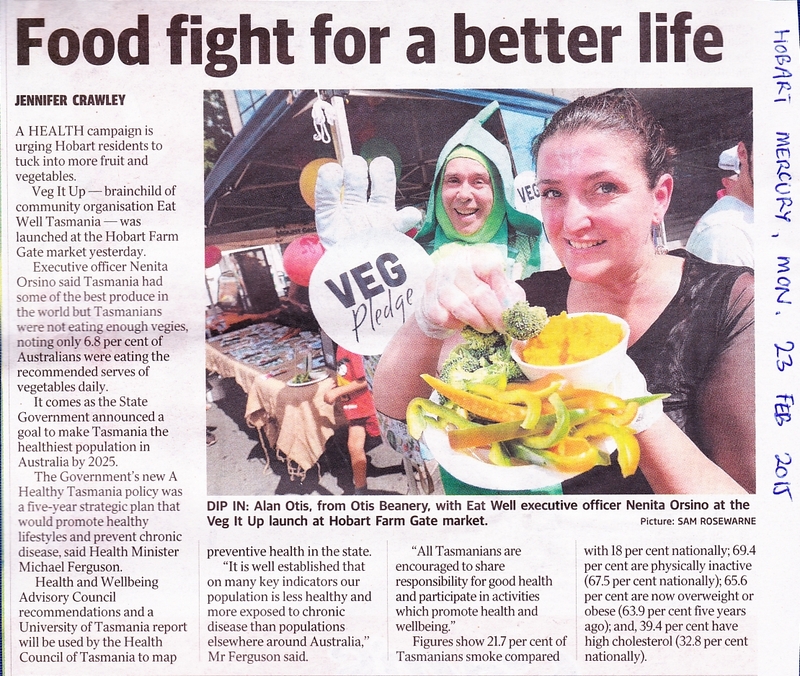 Otis Beanery was delighted to help out at the launch of EatWell Tasmania's Veg It Up campaign on Sunday 22 February. The purpose of the campaign is to encourage people to improve their health by increasing their consumption of vegetables. 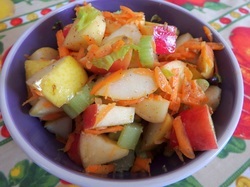 Studies show only 6.8% of Australians are consuming an adequate amount of vegetables. So over the next couple of months you can take the Veg Pledge to improve the diet of yourself and your family. The campaign is running on social media. Show us your vegetable-strong meals and snacks with blogs, photos, tweets and posts and hashtag them #VegItUp. There are some great prizes to be won, including a voucher for two people to attend an Otis Beanery Cooking Class! To find out more it about you can also visit the EatWell page on Facebook. Otis Beanery will be back at The Taste this year, Tasmania's premier food festival. The festival runs from 28 December 2014 to 4 January 2015,. Venue is as usual the precinct around PW1 and Parliament Lawns by the waterfront in Hobart. Proceeds from sale of the kits goes to support the Glenorchy Community Fund. Please drop by our stall if you're at the show and Mr P Peabody will show you how to get stuck into microgreens! Otis Beanery will be serving up some delicious rice paper rolls at Moonah Primary School's Multicultural Feast. You are very welcome to get along to MPS in Derwent Park Rd between 12 ﻿noon and 2pm on Saturday 20 September to join in the fun. You can sample of t﻿he rolls I've made or I'll give you an up-close demonstration of you how to roll one yourself. And of course there'll be plenty of other food there and some fantastic entertainment from our very diverse community. 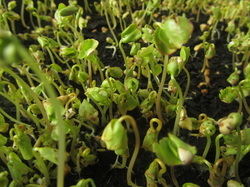 On 4 weekends in July I'll be offering free microgreens kits at my market stall. 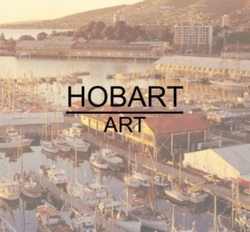 All you have to do is pop along to the Hobart Showgrounds market any Sunday between 8 and 2. In case you haven't been there before, the market is held in the big blue hall which is just inside the entrance to the Showgrounds off Lampton Avenue and then Howard Road. My stall is right at the main entrance, you can't miss it. 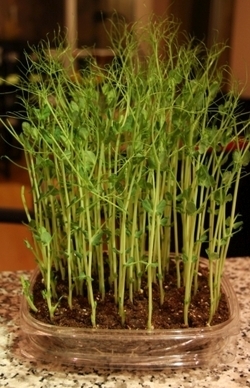 On my display you'll be able to see a few different kinds of microgreens growing and have a taste. To get you started growing your own, I'll have an instruction sheet and a packet of seeds for you to take home. The particular microgreens, and seeds, that I'll have will depend on the week. Over the course of the month I'll have radish, sunflower, buckwheat, pea, linseed, cabbage, brown lentil & various others. 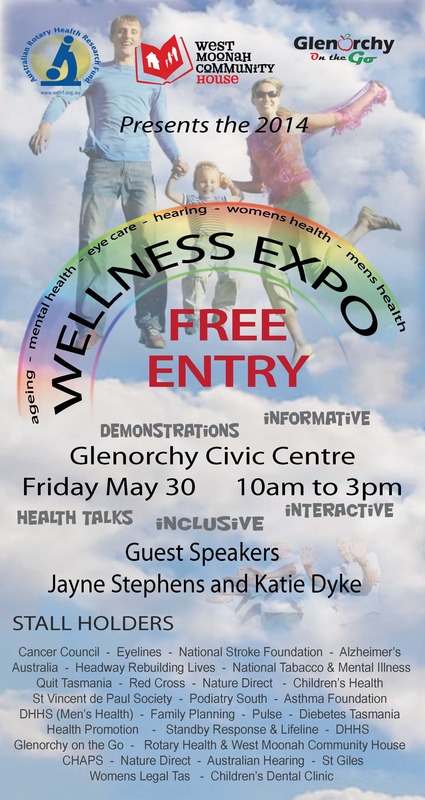 .Come along to this great FREE event - the Wellness Expo on Friday 30th May 2014 - 10am to 3pm at the Glenorchy Civic Centre. Featuring a range of guest presenters from different organisations, you'll be able to find out about men's and women's health issues, eye care, hearing, mental health, family planning and lots lots more. 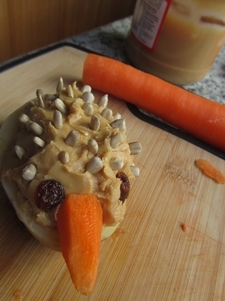 Oh, and my favourite, healthy eating! Otis Beanery will be demonstrating some super healthy snacks including daikon / zucchini roll-ups and pumpkin hommous in cucumber cups. You'll be able to have a taste of both of these as well as see how they're made...win-win! I also hope to have some microgreens ready to sample: the pea shoots look great and fingers crossed the buckwheat is ready by Friday 30th. It all promises to be lots of fun and very worthwhile. I hope to see you there. "Support for ag-gag legislation has now begun to creep into Australian politics, with parliamentarians from both sides of politics calling for similar laws. The 2014 Voiceless Animal Law Lecture Series will examine the rise of ag-gag laws and their effect on transparency and public discourse. To present this topic, Voiceless is proud to welcome award-winning journalist and one of America’s foremost ag-gag experts, Will Potter, as our keynote speaker. The lecture series will explore the use and manipulation of politics, the media and the law by agribusiness to demonise and undermine the animal protection movement, and incite fear within the public." Otis Beanery is going to be involved in a cooking demonstrations at Dads' Day Out at Berriedale on Sunday April 13. Details are still being worked out but we're hoping to showcase some 'doable' fresh and healthy food you can make yourself at home. There will also be lots of sports to try, information stalls and other family friendly activities. Reading about DDO in 2013 will give you some idea what to expect.